Amongst all GCC countries, Bahrain is the smallest country in terms of population, geographical size as well as economy. Bahrain economy is primarily dependent on oil and gas; however, government is aiming to diversify it by targeting in other industry verticals. In Bahrain, expansion in the areas of rail-road infrastructure, airports, new cities, industrial and commercial is leading to increasing urbanization and development, thereby driving the demand for air conditioning systems. According to 6Wresearch, Bahrain air conditioner market is projected to grow at a CAGR of 6.02% during 2015-21. In Bahrain's air conditioner market, split and centralized air conditioner have fueled the growth of the market. Extensive usage in residential and small commercial places have led to the growth of split air conditioners in the country. Infrastructure expansion is expected especially in East Hidd, East Sitra and Northern Town over the next six years. Amongst all regions, Northern region constitutes majority of the market revenue. Region being the home to country's capital, many projects are lined up and are under development phase. Projects includes hotels, commercial offices, universities, factories and housing units. Other regions are also expected to rise owing to growing new industrial hub and housing units. The report thoroughly covers the air conditioners market by types, segments, and regions. The report provides the unbiased and detailed analysis of the on-going trends, opportunities/high growth areas, market drivers, which would help the stakeholders to decide and align their market strategies according to the current and future market dynamics. •	Historical & Forecast data of Bahrain Air Conditioner Market Revenue for the Period 2010-2021F. •	Historical & Forecast data of Bahrain Window AC Market Revenue & Volume for the Period 2010-2021F. •	Historical & Forecast data of Bahrain Split AC Market Revenue & Volume for the Period 2010-2021F. •	Historical & Forecast data of Bahrain Packaged AC Market Revenue & Volume for the Period 2010-2021F. •	Historical & Forecast data of Bahrain Free Standing AC Market Revenue & Volume for the Period 2010-2021F. •	Historical & Forecast data of Bahrain Cassette AC Market Revenue & Volume for the Period 2010-2021F. •	Historical & Forecast data of Bahrain Centralized AC Market Revenue for the Period 2010-2021F. •	Historical & Forecast data of Bahrain Centralized AC Market Revenue, By Components for the Period 2010-2021F. 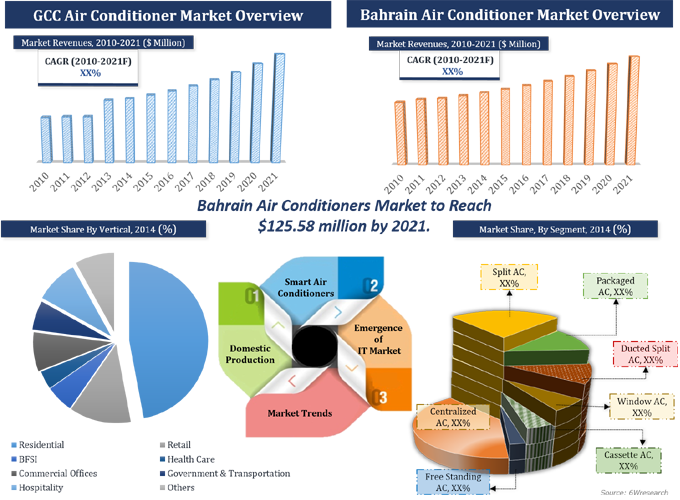 •	Historical & Forecast data of Bahrain Air Conditioner Application Market Revenue for the period 2010-2021F. •	Historical data of Bahrain Air Conditioner Regional Market Revenue for the Period 2010-2014. •	Market Size & Forecast of Bahrain Air Conditioner Regional Market Revenue until 2021F. Bahrain Air Conditioner market is anticipated to grow on account of growing construction industry particularly in residential sector. Government of Bahrain with the help of private housing companies is extremely focusing on building residential units to provide houses to its citizen Some of the projects are in East Hidd, East Sitra and Northern Town. Bahrain air conditioner market report has been segmented into AC types, end user applications and regions. The major companies in Bahrain's air conditioner market include- Carrier, York, Awal Gulf, Gree, Trane, Daikin, Fujitsu General, LG, Zamil and Mitsubishi.